Does Pannell bother to point out to BBC audiences – and al Ghossein – that the Gaza Strip has not been under “Israeli occupation” for nine years? In light of that fact, does he dig deeper in order to give viewers some sort of insight as to how Hamas defines ‘occupation’ and which geographical areas its definition actually includes? Does he pick up on the glaring aberration of an internationally designated terrorist organization – which has targeted Israeli civilians with thousands of military grade missiles for fourteen years and sent dozens of suicide bombers to carry out carnage in Israeli cafes, shopping malls and buses – lecturing BBC viewers on “ethics”? The answer to all those questions is of course no. Instead, Pannell allows al Ghossein a platform from which to cynically commandeer the language of human rights, turning a violent, antisemitic terrorist organization into a popular movement for “freedom”. Pannell then tries to steer al Ghossein towards expatiation of Hamas’ pre-ceasefire demands – a theme we have seen being advanced repeatedly in BBC coverage in recent days. Pannell interrupts, but not to clarify to audiences that al Ghossein’s version of events is inaccurate and untrue. Instead, Pannell is looking for advancement of his selected theme. Pannell still hasn’t got what he came for. Finally, al Ghossein responds to Pannell’s repeated prompts and the buzz words arrive. 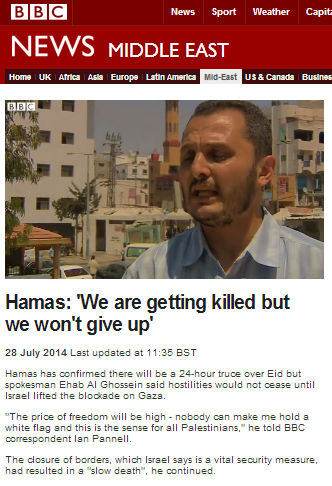 As an aspiring “standard-setter for international journalism” the BBC should be deconstructing Hamas propaganda in order to help audiences cut through the terrorist organisation’s rhetoric and understand the real issues at stake, but audiences have not seen that happen at any time during the last three weeks. This lackluster performance by Ian Pannell in which he failed to challenge even one of al Ghossein’s falsehoods on the one hand and facilitated the portrayal of a terrorist organization as some sort of troop of benevolent human rights campaigners on the other, shows yet again that in its reporting from the Gaza Strip, the BBC’s ‘standards’ are much more in line with those of the propaganda spouting Al Aqsa TV run by its Hamas hosts. Clearly, you are struggling through your pathetic existence with a brain barely the size of a split lentil. 1100 Palestinian CIVILIAN casualties, you claim!! – even ignoring the issue of unconfirmed casualty figures, what you are clearly claiming is that NONE OF THE DEAD in Gaza were actually Hamas fighters! Don’t you DARE accuse other people of what you falsely claim to be ‘propaganda’, and then spout such complete and obvious bullsh*t yourself. Better to stay silent and be thought a fool than to open your mouth and remove all doubt. As for your ‘concentration camp’ claim, if Gazans don’t need to be prevented from inflicting their murderous tendencies on their neighbours, then why do you imagine Egypt has found it necessary to close its borders to its ‘muslim brothers’ in Gaza as well? How blind can you actually be? And while we’re at it, the current conflict was not started by Israel at all, and was certainly not about 3 boys being murdered. The IDF finally took action as a result of the increasing hail of missiles emanating from Gaza, which became more and more frequent during the timeperiod they were looking for those boys, but had been steadily increasing even preceding that. 400+ missiles flew out of Gaza into Israel’s civilian communities between the start of this year and the point at which the 3 kids were snatched. That in and of itself serves to illustrate why BOTH Gaza’s neighbours have found it necessary to prevent Gazans moving freely amongst them. Tough luck for Hamas that the Israelis now have Iron Dome, and it’s harder to kill them with missiles: it doesn’t alter the fact that Hamas is consistently deliberately aiming at Israeli civilians, and it’s only Israel’s careful preparation and planning that prevents carnage. Israel has an obligation to its citizens to do what it can to stop Hamas’s attacks. If civilians are now getting killed in Gaza as a result, that’s ENTIRELY down to Hamas’s actions, and the way they DELIBERATELY operate out of civilian areas and buildings, ensuring civilians are all around them as they carry out their terrorism. If Hamas want to stop Gazan civilians being killed, all they have to do is simply stop firing their own missiles into Israeli towns and cities – but they won’t stop, because they couldn’t care less – in fact the worse they can engineer any situation in Gaza to look before they drag the world’s cameramen in to film it, the more morally and mentally challenged idiots like you fall for their crap.